The little girl who’ve arrived last week, has been baptized Adiatou (nickname Adi). She is still lost and we don’t see much joy in her eyes. She’s still eating well and loves her baby cereal (she didn’t at first). 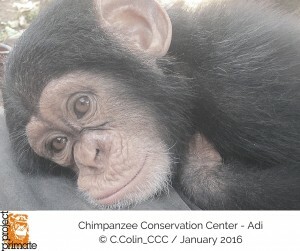 She is still in quarantine with Justine, her surrogate mother, since the two other infants, Soumba and Kanda got a cold. She should be presented to them in a few days which will help her regain some joy, hopefully.